Eat local. In general, I agree with the phrase . . . most of the time. I love the idea of supporting local farmers and the idea of eating foods grown close to my home. Plus, it’s fun. I like frequenting old vegetable and fruit stands, the quirks of each one and the personalities of their owners. I like knowing the chicken that produced my eggs. For a few years, I was an avid locavore, after reading Animal, Vegetable, Miracle by Barbara Kingsolver, which is a really fabulous read that I wholeheartedly recommend. I still try my best to get local fruits and vegetables when I can, and I’m lucky enough to live in one of the most fertile parts of the world, so it’s not too hard to get tons of local goodies. Unfortunately, though, there are no Oregon-grown bananas (at least that I’ve found), and, eventually, I gave in and started eating them again. In large quantities. They’re just so convenient and so delicious. Plus, they’re cheap and one of the least likely produce items to be contaminated with pesticides. Their tough skins protect them from most of the chemicals. I love them plain, frozen, on toast with peanut butter, made into ice cream (I will share this recipe soon), and, perhaps most of all, in baked goods. The problem is, although bananas are a healthy treat, banana bread usually is not. Most of the time, you might as well really indulge and have some cake instead. This recipe is, in my opinion, a fabulous intersection of the tasty and the healthy. It took me quite some time to develop a recipe that was still sweet and fluffy, and not cardboardy at all, but I think you will like the results. I think the walnuts on top are essential, as I love their toasty crunch, but you could certainly leave them off. 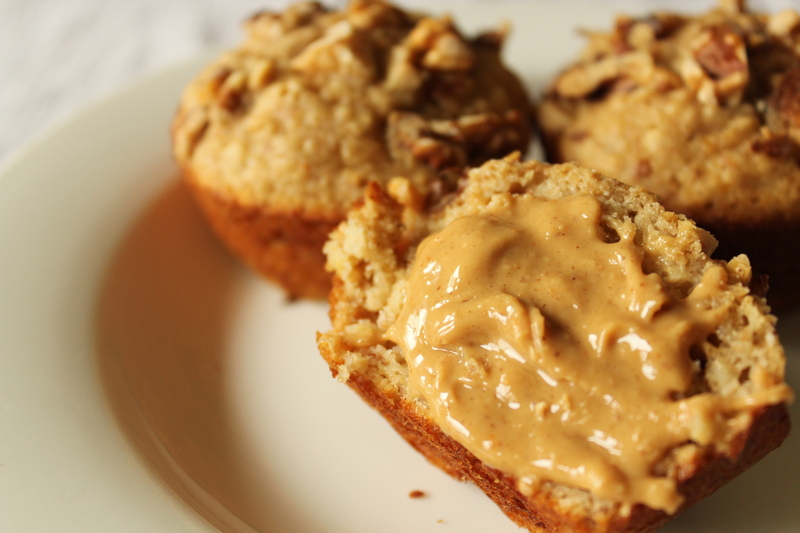 These are perfection served slightly warm and slathered with natural peanut butter. The saltiness of the nut butter goes so well with the sweetness of the banana. This is a fun recipe to make with kids. My daughter loves to smash the bananas and stir the ingredients together. Special Diets & Allergies: Soy free, vegetarian, dairy free, nut free if you leave out the walnuts. 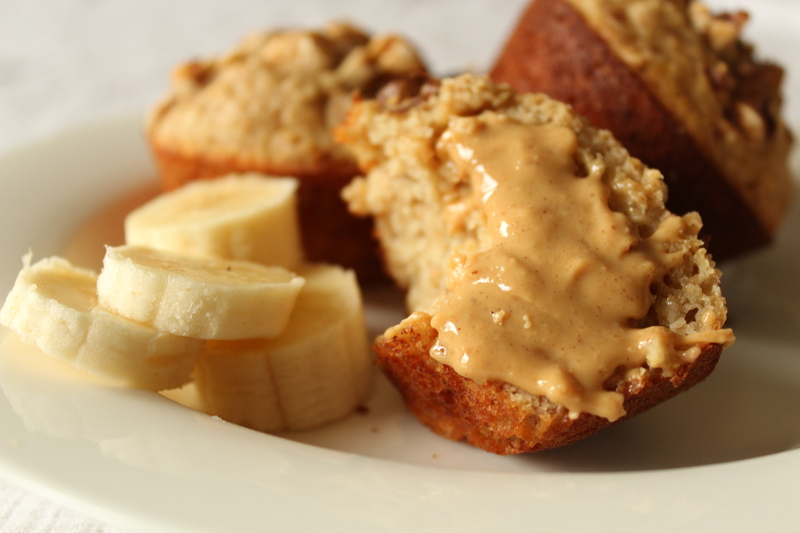 If you love banana bread, but want a healthier option, these delicious mini-cakes are for you. They’re 100% whole wheat, packed with heart-healthy oatmeal, and crammed with delicious, sweet bananas. 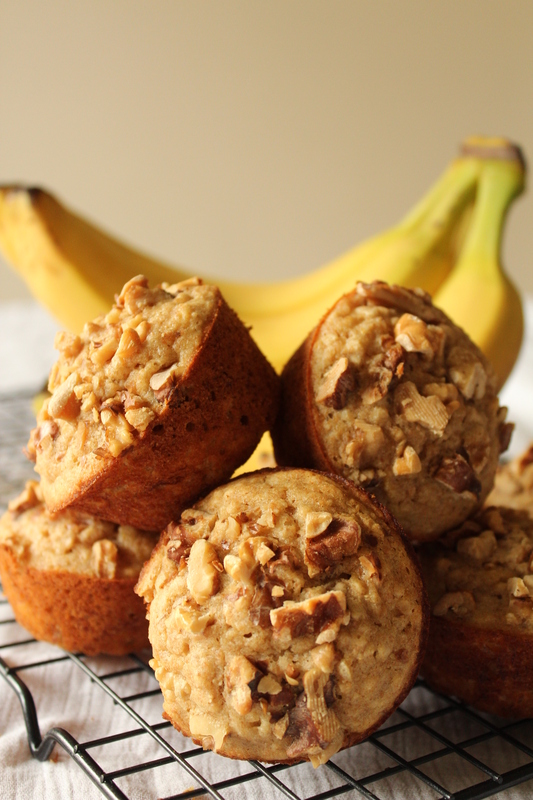 Make sure you use extra-ripe fruit here; the browner the banana, the sweeter the muffin. As always when using whole wheat flour in baked goods and a natural sweetener, make sure you pop these in the oven as soon as you possibly can after combining the wet and dry ingredients. The baking powder will start going fast, and you want to get them cooking before it fizzles out. Try to wait until these cool a bit before serving. They need a few minutes to firm up and for the banana to cool. Preheat the oven to 375 F. Grease or line a standard 12-cup muffin tin. Combine the flours, oats, and baking powder in a small mixing bowl. Combine the milk and apple cider vinegar in a large mixing bowl. Whisk. Add the agave, banana, oil, egg, and vanilla and whisk to combine. Add the flour mixture to the milk mixture and stir just until combined. Spoon into the muffin tin. Sprinkle with the walnuts. Bake for about 20 minutes, or until the tops spring back when pressed with a finger and the edges are just beginning to turn a golden brown. Let sit for about 5 minutes, then remove muffins from the tin. Cool on a wire rack.